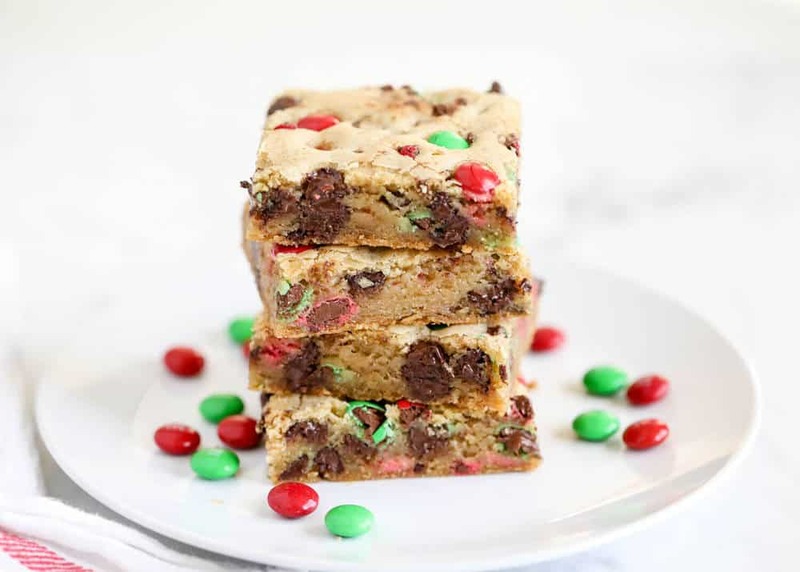 Christmas M&M Cookie Bars – Gooey, soft and fluffy cookie bars loaded with M&M’s and chocolate chips. 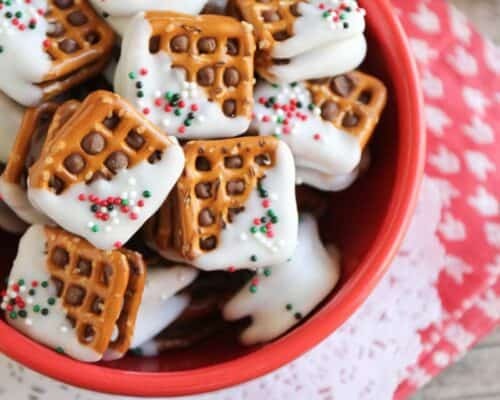 So easy to make and perfect for a cookie exchange or holiday party! I love to bake all types of Christmas cookies during the holidays. 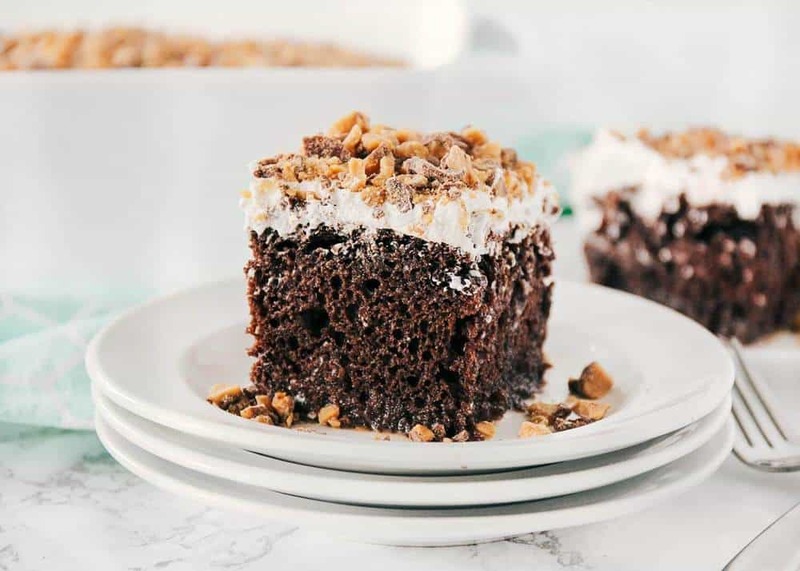 There’s just something about baking on a cold winter day that is so cozy and comforting! These M&M bars are always on my list to bake, as well as ginger molasses cookies, snickerdoodles, rolo pretzel sandwiches and sugar cookies. 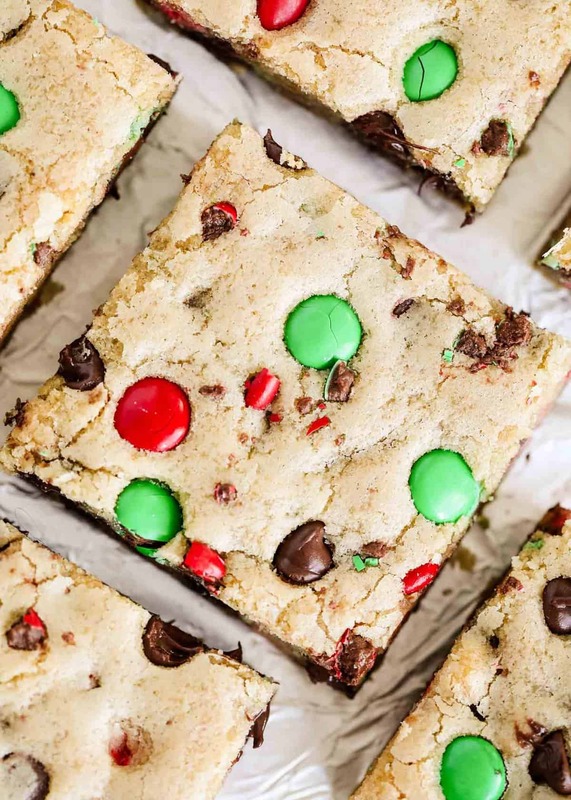 I’m excited to share these delicious M&M cookie bars with you today! 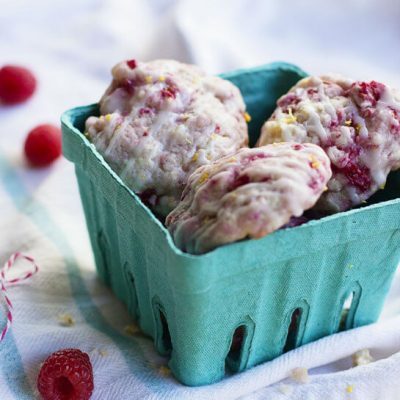 They make the perfect treat for a cookie exchange or holiday party. They’re gooey, festive and filled with chocolate chips AND M&M’s! Plus they’re so easy to make, too! Cookie bars have to be one of my favorites. I’ve made so many different versions, like sugar cookie bars, congo cookie bars, Oreo cookie bars and more. 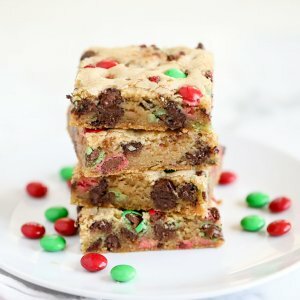 I have to say, this M&M cookie bars recipe is one of my favorites! I finally perfected them just in time for the holidays and trust me, you want to make them. They are so delicious! I love that these Christmas cookie bars take only a few ingredients to make. At the beginning of the holiday season, I’ll typically stock up on Christmas colored M&Ms for holiday baking. I usually have all of the other ingredients on hand, which makes this an easy go-to Christmas cookie recipe. 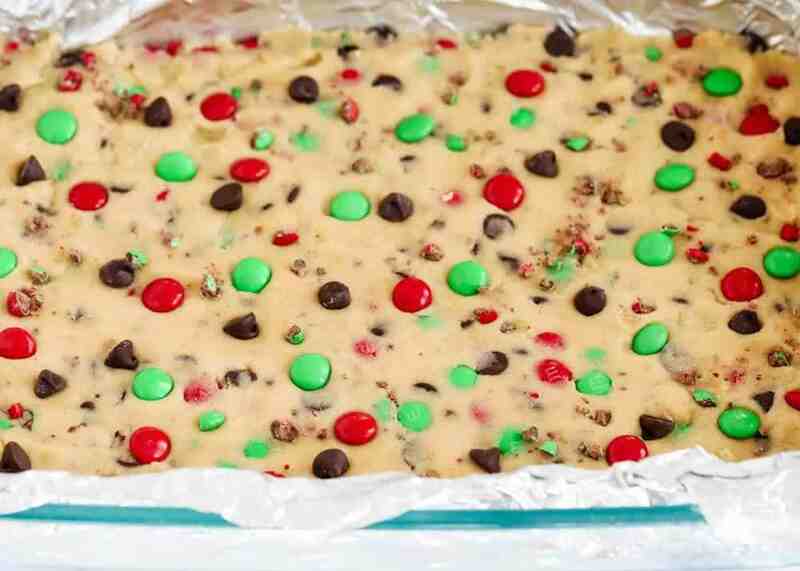 Scroll down for the printable M&M cookie bars recipe. Preheat oven to 325°F and line a 9×13″ pan with foil. In a large bowl, cream together butter and sugars with a mixer for 1 minute. Add eggs and vanilla and mix. Then add flour, baking soda and salt and stir. 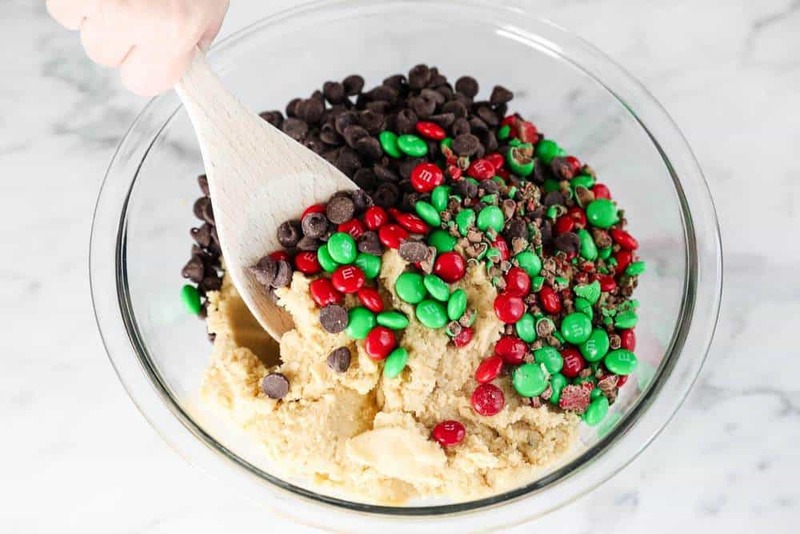 Fold in M&M’s and chocolate chips and add dough to pan. Place a few extra M&M’s and chocolate chips on top. Bake for 30 to 35 minutes, or until top is barely golden brown. Allow to cool completely, then remove and slice. TIP: For thinner M&M bars, use a 15×10″ pan instead. You can make these M&M bars anytime throughout the year! Just pick up colored M&M’s that match the occasion or holiday. Don’t have M&M’s on hand? Replace M&M’s with 1 cup chocolate chips. To top with glaze, combine 1 cup powdered sugar and 1 tablespoon of milk. Drizzle over M&M bars once cooled. Make sure to line your baking pan with foil! This really helps the Christmas cookie bars to cook evenly. M&M bars will keep at room temperature stored in an airtight container for about 3 days, or about 5 days in the fridge. To freeze, wrap in foil then place in an airtight container. They will last in the freezer for a couple of months. 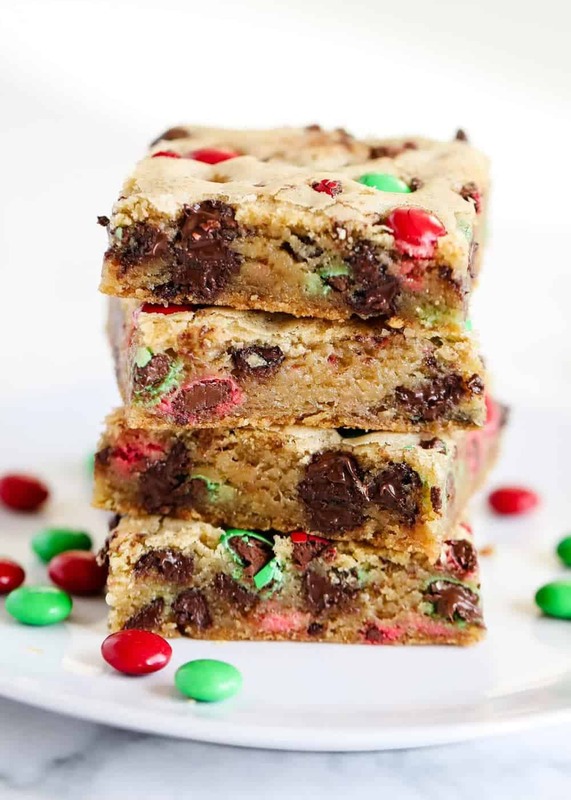 Christmas M&M Cookie Bars - Gooey, soft and fluffy cookie bars loaded with M&M's and chocolate chips. So easy to make and perfect for a cookie exchange or holiday party! Preheat the oven to 325°F. For thick bars, line a 9x13" pan with foil. For thinner bars, line a 15x10" pan. Leave an over hang for easy removal. Then spray with non-stick spray. In a large bowl using a mixer, cream together the butter and sugars for 1 minute. Add the eggs and vanilla and mix until combined. Add the flour, baking soda and salt and stir mixture just until combined. Fold in the chocolate chips and M&M’s (saving about 1/4 cup for the top). Scoop cookie dough into the pan. Then place extra M&M’s and chocolate chips on the top. Bake for 30-35 minutes, or until the top is barely golden brown. Allow to cool completely, then remove and slice. To top M&M bars with glaze, combine 1 cup powdered sugar + 1 TB milk and drizzle over cookies once cooled. This is a very good cookie recipe. Made these for church luncheon. Very easy to whip up and feed a crowd. The sides got a little more crispy but the middle was perfect! I love these so much and I love your recipe. 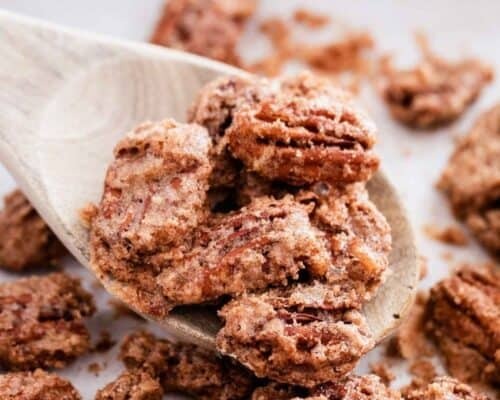 Our family LOVES these easy cookie bars! My kiddos go bonkers for these! Perfect for the holidays. These look so fun with the festive red and green m&m’s but love the idea of changing it up during the year. Maybe even doing the customize M&M’s for the kids’ birthdays. I absolutely love these!! They are festive & so good!! These cookie bars are SOOOOO yummy! My kids loved them! M&M bars are the best!!! I love that you used the red and green m&m’s for the holidays.